You can find my Day 1 update here. Having read close to half of Inside the O'Briens the previous day, I set myself the goal of completing it the following day. By end of day Tuesday, not only had I completed my current read, but I started another also. Switching format, I delved into an ebook... The only trouble with including ebooks in the readathon is the fact that my Kindle and me aren't getting on too well at the moment as it no longer shows me the page count of any given book. So I won't be updating the actual page count on ebooks until completed, just the percentage of said book. I just barely started The Woman in Cabin 10, with just 6% having been read. We were out and about a fair bit on Wednesday, enjoying what is probably the last of the summer sunshine here in the Wales, which meant little reading time. Not only because we were having fun in the sun, but I felt a little 'meh' about reading to be honest. I feel like this every now and then, and some weeks I will go a day or two without reading in a week, which is why I tend to only read one book a week typically. Being that I am partaking in a readathon currently, despite my mood, I did want to make a conscious effort to read at least once a day and so I did get in a little bit of reading on Wednesday - just an hour or so. I ended Wednesday with a total of 27% read in my ebook. 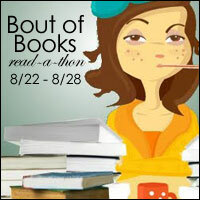 How is the readathon progressing for you? When I do a ton of reading (like in a readathon), sometimes I just need to take some non-reading time. I can't wait to hear about the rest of your Bout of Books reading! When taking part in a readathon there is definitely the danger of burning out, it's good to recognise that. You're doing great! Even a little is better than nothing. I could only manage reading 30 pages last night - I was just too tired and couldn't keep my eyes open. Hoping for a better reading night tonight. A little is better than nothing - so true! I hope you're enjoying your current read!